At Atrium, PreK students are encouraged to ask, "Why?" as often as they can. By noticing and wondering, Originators are able to understand more about the world around them while building fundamental skills for future science learning. "In PreK, we focus on asking questions with the understanding that 'I don’t know' is a great answer because you can always find out!" said PreK teacher Mia Bullock. "In practice, we create both structured and unstructured activities that provide the opportunity to explore and question. The hope is that the world around them will become accessible." Originators study life science through monthly observation of the growth and change of their class tree. Students visit the tree monthly, sketching changes to the tree through the seasons and making changes on the tree on their classroom wall. 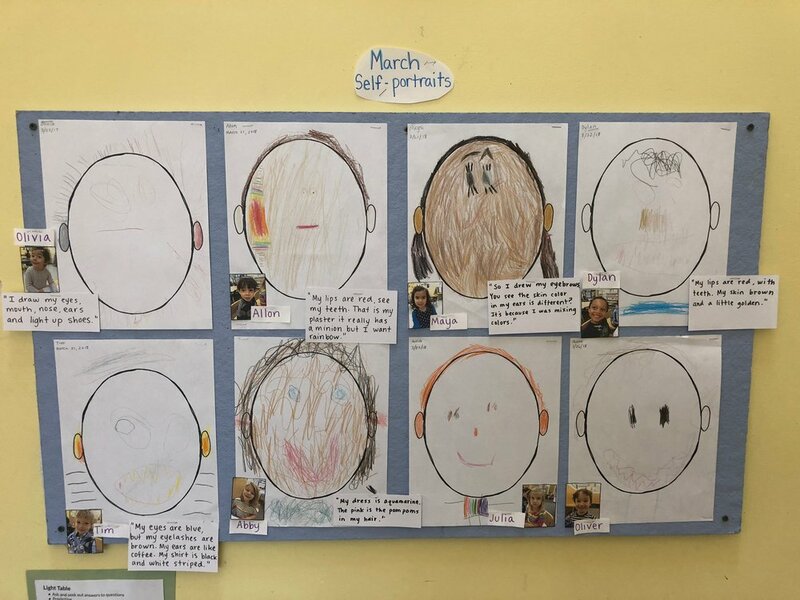 At the same time, students track their own growth through a growth chart and monthly self-portraits. In the spring, they will raise ladybugs and butterflies, observing and measuring their growth from eggs to their full-grown state. In winter, they read about different animals and how they adapt to the changes in weather. The class compared the life of woodland animals to their own, relating fur coats to winter jackets and mittens. Throughout the year, the class visits Willow Pond at Mt. Auburn Cemetery, looking for changes in the environment to learn to appreciate nature and their surrounding community. How have things changed? How have we changed? These are the continuing questions. Aside from the science connected to the class theme, "What is Change? ", PreK science curriculum is fluid. Through wonder and exploration, students are able to discover more about their world, from their bodies to space. At the beginning of the year, the class was learning about their bodies and exploring their five senses: touching, tasting, smelling, listening to, and looking at different materials. As students practiced making observations, they realized that their senses help them interact with the world around them. With hands and all their senses on materials, they also think about the shape of what they care coming to know. Originators are currently studying space. 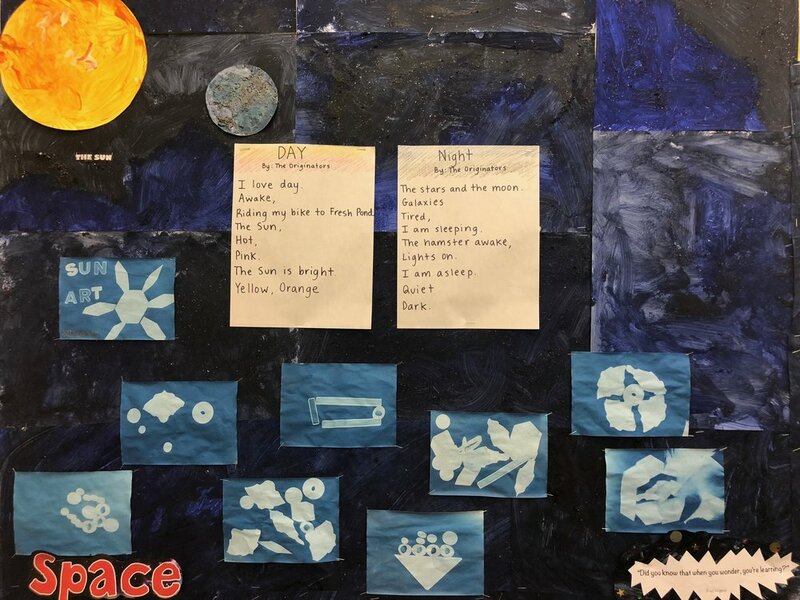 They spend time studying each part of the solar system, starting with the Sun, reading books and doing puzzles about the planets, as well as painting a version of each one in class. "We wonder about each planet, asking questions and answering them using resources in our classroom. Our art, literacy, math, dramatic play and sensory table all connect to our space unit. 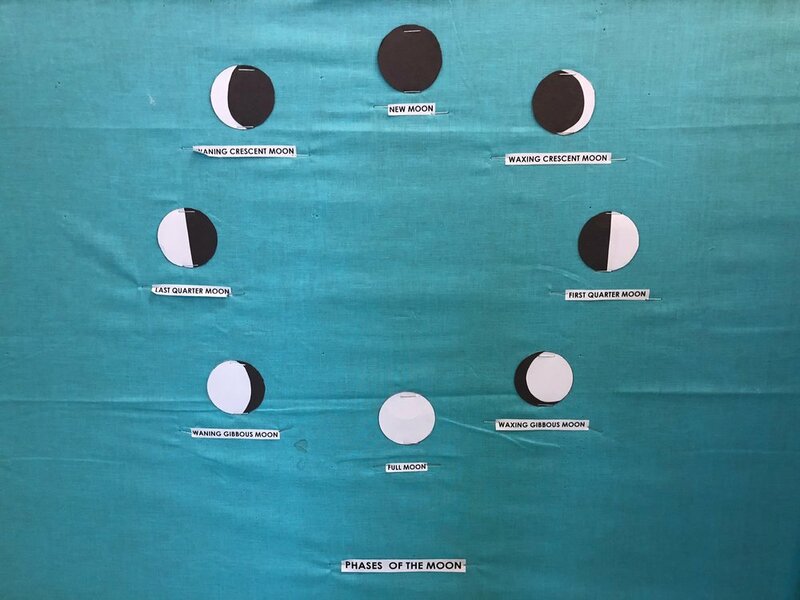 Based on interest, we spent extra time on the Sun exploring shadows and 'What makes night and day?'" Mia said. Originators used rayographs to study the way shadows are made by the Sun. "Our classroom environment is filled with materials and resources for the students to explore and investigate," Mia said. "We have books on animal tracks that a student might read and then wonder about why certain animals have claws and why a track is wider or narrower. As teachers, we encourage the students to explore these wonderings, maybe creating an animal in the craft area, or making footprints in the sand table or building a habitat in the block area." Students have explored physical science by exploring the states of matter (solids, liquids and gases). They read books, describe and compare different materials, move their bodies around the room like the molecules in the different states of matter, and create art using materials in various states. This exploration connects students to the world around them. Mia said, "In connection to a unit on transportation, a student asked, 'Why does a boat float?' We then explored sinking and floating. We tested and experimented with different materials, seeing which would hold more weight and if material or shape had more of an effect on ability to float." If you ask the students about what they're learning, they will happily tell you. When asked about the class tree and the changing seasons, Tim said, "The first time, there were leaves on the tree. Then they fell off and then the snow came and fell down, and then melted, and now there are buds." When asked about planets, Maya said, "The Sun is 93 million miles away from the Earth, but it only takes eight minutes for the sun to get here. More than one million Earths can fit in the Sun. The interesting thing is that Mercury is too hot because it is so close to the Sun. If we went there, we would burn on one side and die on the other because it's too cold. Venus has clouds made of poison and ground made of lava so you can't walk on it. You can't breathe the air on Venus." "Honestly, science is ever-popular in PreK," Mia continued. "It's a time for them to take charge of their learning. They love to ask questions and learn why and how the world works. The 'But, Why?' response that is all too familiar at this age is encouraged in our classroom and we hope to help find out the why of their questionings."